If you love entertaining or enjoying the great weather we have here in Brisbane, all year round and want to cook outside as well as eat alfresco, you may consider building an outdoor kitchen. An outdoor kitchen is an easy way to increase liveability to your Brisbane home. Unique Designs can help you transform your outdoor space into a space where you want to spend more time. At Unique Design we will custom build outdoor kitchen based on your needs and the feeling you are trying to achieve. We will design a kitchen based on your ideas and create a contemporary space that fits the style of your outdoor area and home. We have designed and built outdoor kitchens across Brisbane. Here are some examples that may provide some inspiration. This beautiful Alfresco Outdoor Kitchen designed by Michael Peacock is located in Albion. It utilizes StyleLex weather resistant doors and panels and Galaxy Black Granite 40mm benchtops. It features a Beefeater Signature BBQ, Husky Bar Fridge and Abey Schock Soho black sink. 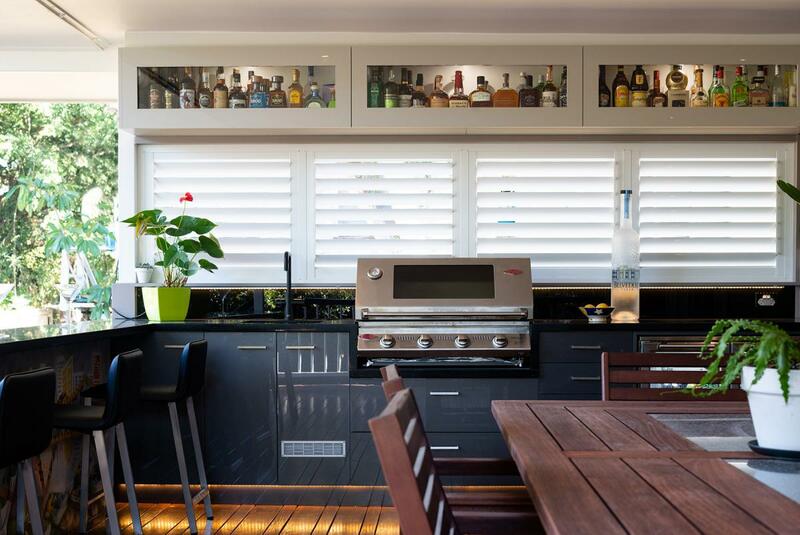 This beautiful Alfresco Outdoor Kitchen designed by Simon Taylor is located in our modern showroom in Clayfield. It utilizes StyleLex weather resistant doors and panels and Silestone Dekton Keyla Natural 12mm benchtops.It features a Beefeater BBQ, Whispair New York Canopy Rangehood, Bosch 45cm Dishwasher, Vintec Wine Fridge and Abey Schock black sink.